Representative Honours: Ireland: 3 Full Caps (1931); Irish League: 3 Caps (1931-1934). Club Honours: (with Ballymena) Irish Cup Winner 1928/29, Runner-Up 1929/30, 1930/31; City Cup Runner-Up 1928/29; Gold Cup Runner-Up 1931/32. 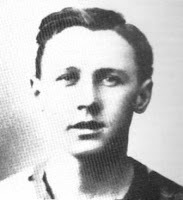 Harryville born, the tough tackling full-back Jock McNinch began his career in the local Intermediate league with Summerfield but was given his chance in the Irish League with the new Ballymena Football & Athletic club, becoming one of the light blues’ first signings in June 1928. It was a dream first season in senior football for McNinch and the ‘Ballymena Babes’, as Jock became a virtual ever present in the team that flourished in local football winning the Irish Cup final in April 1929 against Belfast Celtic at the Oval. McNinch was the only locally born player in the Braidmen’s line-up as the club won the prestigious trophy in their first season and also finished as City Cup runners-up the following month. Success continued at the Ballymena Showgrounds, with two further consecutive Irish Cup final appearances in which Jock started in both defeats to Linfield in 1930 & 1931. His form in the 1930/1931 season was boosted by the defensive influence former Rangers veteran Billy McCandless and this resulted in a call up from selectors to the full Ireland team in February 1931. McNinch’s impressive debut in the 0-0 draw with Scotland was enough to attract firm offers from both Liverpool and Preston North End, which were rejected out of hand by the Ballymena committee. Two further international caps followed during the 1931/1932 season against Scotland and Wales but eventually he lost his place at full back to Glasgow Celtic’s Billy Cook; but set an unbeaten club record for international caps in the process. During the peak of his playing days, Jock found himself in flux as Ballymena were suspended by the Irish League in April 1934 for refusal to submit their financial records as part of an investigation to payments to amateur players and eventually were wound up after only six years of competitive action. 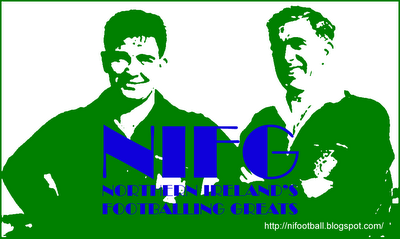 McNinch was one of the few players who stayed loyal to the new club, Ballymena United FC, who rose out of the ashes of the suspended club ahead of the 1934/1935 season and continued to play at the Showgrounds, with the same colours and same support base. His eight years’ service to senior football in Ballymena was rewarded with the club’s first ever benefit (testimonial) match against Linfield in April 1936. This was to be his last appearance in Ballymena blue as following a record combined 316 appearances and 15 goals for both Ballymena FC and Ballymena United FC, Jock made the move west to League of Ireland club Sligo Rovers in the summer of 1936. His stay lasted only a few months before he returned to the Irish League to play out his final season in senior football with nearby Larne. As the Second World War broke out, Jock became a seaman in the Royal Navy and then immigrated to Canada in the 1950s before returning to football as a referee and a linesman in the Irish League, he remained a regular supporter of Ballymena United up until his passing. Summary: 3/0. Won 1, Drew 1, Lost 1. * listed incorrectly in many sources as Joe. Representative Honours: Ireland: 8 Full Caps (1925-1928). Club Honours: (with Reading) Football League Division Three (South) Champion 1925/26. Billy McConnell's family moved to Slough when he was four years-old, and it was there that he began his footballing career. At the age of 16 he aided Slough Town to the Berks & Bucks Cup, eventually making it to senior football with Reading in 1924. He quickly established himself in the Royals' first eleven and is still regarded among the clubs greatest ever left-backs. In 1926 he aided the club to the Division Three (South) title and the 1927 FA Cup semi-final where they lost out to eventual winners, Cardiff City. A "finely built player" who "used his physical strength to the limit", McConnell earned a number of representative honours. He played for the Professional of the South against the Amateurs of the South in a match that tried out a new form of the offside law. In 1925 he won the first of ten consecutive selections for Ireland, though due to injury and club commitments he was able to accept only eight of them. Five of his international appearances saw him line-out in the same team as club-mate Hugh Davey. McConnell's total of eight caps remained a Reading club record for 60 years. McConnell scored just once in his Football League career, against Middlesbrough in 1927. Unfortunately, in scoring against the Second Division Champions-elect he picked up an injury that would eventually force him to retire from playing. Later he qualified as a Football League linesman and played cricked for Berkshire. He also ran a pub in Reading and later became a newsagent in Slough. Summary: 8/0. Won 2, Drew 4, Lost 2. Representative Honours: Ireland: 6 Full Caps (1912-1914); Irish League: 3 Caps (1913). Club Honours: (with Bohemians) Irish Cup Runner-Up 1910/11. 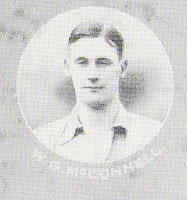 Ireland’s right-back for the entire Home Nations campaign of 1914, when they won the title outright for the first time, Bill McConnell had a remarkable record at international level. His first game, played at left-back against Wales in 1912, resulted in a 3-2 win. The following year, installed in his favoured right-back role, he played in a 2-1 victory over England at Windsor Park – Ireland’s first success against their largest neighbours. In all his six caps he finished on the losing side just once; 1-2 against Scotland in 1913. In a hard-fought and crowd-troubled match at Dalymount Park, his home ground, McConnell put in an energetic performance, and only the mis-firing forward-line denied the Irish a more favourable result. On the domestic front McConnell was playing for Bohemians at a time of ups-and-downs. In 1911 he played in the all-Dublin Irish Cup Final defeat by Shelbourne. That same year Bohs, having finished bottom, withdrew from the Irish League. A year later they returned and in autumn of 1913 McConnell represented the Irish League in three consecutive matches (defeats by the Football League, Southern League and Scottish League). Summary: 6/0. Won 4, Drew 1, Lost 1. Representative Honours: Northern Ireland: 1 Full Cap (1984), Junior, Youth, 1 Schools Cap (1976); Irish League: 5 Caps / 1 Goal (1984-1989), 'B' Division; Co. Antrim Representative. Club Honours: (with Linfield) Irish League Champion 1981/82, 1982/83, 1983/84, 1984/85, 1986/87, 1988/89; Irish Cup Winner 1981/82, Runner-Up 1982/83, 1991/92; Irish League Cup Winner 1986/87, 1991/92; Gold Cup Winner 1981/82, 1983/84, 1984/85, 1987/88, 1989/90; Ulster Cup Winner 1984/85; Co. Antrim Shield Winner 1980/81, 1981/82, 1982/83, 1983/84. Awards: Ulster Footballer of the Year 1985; NI Football Writers’ Player of the Year 1985; European Silver Boot 1984/85. The 1984/85 campaign witnessed the most sustained consistent goalscoring run by an Irish League player since before World War Two. From a 26 game League season Martin "Buckets" McGaughey scored 34 goals, and a total of 56 in all competitions from fifty appearances for Linfield. He took his seasons tally to 57 with a goal in a 4-0 inter-league win over the League of Ireland at Windsor, but an injury in the closing weeks of the season caused him to miss the Irish Cup Final defeat by Glentoran, and possibly robbed him of the European Golden Boot as Europe’s top goalscorer – he had to make do with the Silver prize. First spotted by Linfield scouts as a youngster in Moneyreagh, McGaughey proved a useful goalscorer with the Rangers and Swifts sides before breaking into the first eleven. He also impressed with the Northern Ireland Youth team, finding the net in a 2-1 defeat by the Republic of Ireland at the Oval in January 1979. For all his pedigree, McGaughey was slow to find favour with the Windsor faithful as he consistently misfired in his first three years as an Irish League player. With the Swifts the touch never left him and he picked up winner’s medals in the ‘B’ Division and George Wilson Cup and represented the ‘B’ Division against their League of Ireland counterparts, scoring in a 3-0 win in 1980. Finally, mid-way through the 1980/81 season McGaughey found his feet in senior football, taking his goalscoring total to fourteen for the season with a brace in a 4-1 Co. Antrim Shield Final win over Glentoran – it was to be the first of many senior medals. McGaughey finished as Linfield’s top scorer in 1982 as he won his first Irish League and Irish Cup winner’s medals. He added another Co. Antrim Shield medal and a Gold Cup winner’s medal to his collection, scoring the late equaliser against Ballymena which took the final to penalties, and slotting home in the shoot-out success. The honours and goals didn’t stop for another three seasons, he was Linfield’s top goalscorer as the League title was retained in 1983, and topped the Irish League charts for the first time in 1984, celebrating the feat with another title success. By the end of 1984/85’s first competition, the Gold Cup, McGaughey had seven goals to his credit, the Player of the Tournament and Golden Boot awards (including a flight for two on Concorde!) and of course a winner’s medal after his goal had seen of Glentoran in the Final. In the European Cup Linfield saw off Shamrock Rovers on away goals thanks by a strike by David Jeffrey at Milltown. In the second round they were drawn against Panathinaikos and after Billy Totten gave Linfield an early lead in front of 50,000 baying Greeks they eventually lost 2-1 through a heartbreaking 88th minute goal. In the return at Windsor Park, 7,500 fans saw McGaughey score two early goals (one a penalty) as Linfield raced into a 3-0 lead. The “experienced” Athens team won a “harsh” penalty on the half-hour mark, and from there brought the scoreline to 3-3, and Linfield bowed out “bravely”, 5-4 on aggregate. In the Ulster Cup McGaughey scored nine goals in nine games, including an 88th minute equaliser in the 2-2 Final draw with little-fancied Larne at the Oval. In the penalty shoot-out Linfield won three kicks to two. As the Irish league campaign kicked-off in November 1984 McGaughey already had 17 goals from his 19 appearances. 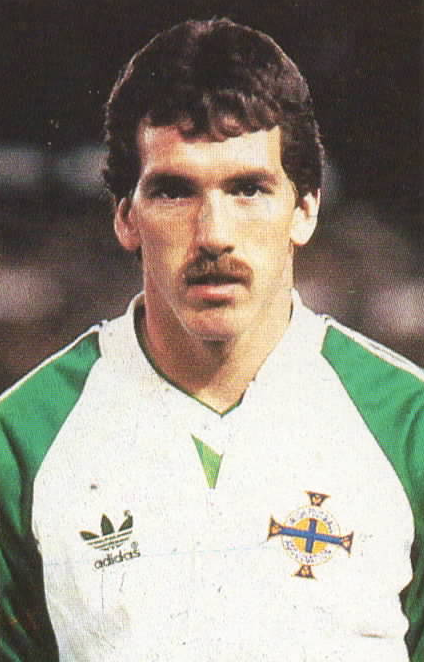 He also had his first international cap, coming on as a late substitute for Norman Whiteside in a 3-0 friendly win over Israel, and that goal in the Irish League’s win over their southern neighbours. Four goals in the opening Irish League fixture, a 6-1 win over Carrick, proved an excellent indication of what was to come. By Boxing Day his total for the season was 32, and by the end of January he had hit 42 goals as Linfield pulled clear at the top of the Irish League. The Irish Cup kicked off with a convincing 5-2 win over ‘B’ Division Banbridge Town, McGaughey bagging one. His only other Irish Cup goal that season came in the 3-0 semi-final win over Ballymena. McGaughey didn’t make the final, where Linfield lost out to Glentoran in a replay, as a serious knee cartilage injury ended his season in April. At the time he was clear favourite for the European Golden Boot, but in the end he finished two goals behind the eventual winner, Portuguese striker Fernando Gomes. The knee injury not only robbed him of a potential Irish Cup winner’s medal and Golden Boot, but also almost ended his career. Eventually he travelled to the USA for surgery which saved his career, but he did miss the entire of the 1985/86 season. McGaughey returned to the Linfield team in 1986/87 season, and normal service was quickly resumed with honour following honour, and he finished as the Irish League’s topscorer in 1988 and 1990. At his peak McGaughey rejected numerous moves to full-time football, notably to Barnsley and to play in Austria, but by the early ‘nineties he was in-and-out of the Linfield firstteam due to continual injuries and younger competition for places. After 317 goals in 533 games for Linfield, McGaughey signed for Ards in May 1993. He continued to struggle with injuries at Castlereagh Park, and he hung-up his boots after just one season.